Medals like this example made the image of the Ottoman ruler Mehmed II enduringly famous in Europe. Numerous contemporary casts of such medals survive, reflecting the level of western interest in the Ottoman dynasty. Mehmed II's aggresive expansionism and threat to Europe meant frequent wars, and contemporary written accounts of the court and customs of the Ottoman Empire fired the imagination of Christian Europe. Medallic representations designed or derived from portraits by the Italian artists patronized by the Sultan were a key medium by which Europe became familiar with the Sultans image. Cast in bronze or lead, the Renaissance portrait medal commemorated individuals or events. They were used as gifts and mementoes and were inspired by Roman coins, with their portraits of rulers and allegorical representations on the reverse, excavated all over Italy and eagerly collected by humanists. In 1479 Gentile Bellini, the most prestigious Venetian painter of the time, went to the court of Sultan Mehmed II in Constantinople. He was sent following a request from the sultan for a skilled Venetian artist after peace was agreed between Venice and the Ottoman Empire. At appropriate times, according to peace treaties, he sent envoys to various Italian states requesting artists be sent to his court. Such envoys had been sent to Venice and Florence in 1479. He wanted portraits to be made of himself by an Italian artist, having a great personal interest in Italian art and culture, including painting and medallic sculpture. European figural art greatly interested him and was an established feature of the Sultan's court, although its influence was resented by religious groups. Bellini became an intimate of the court and produced work for Mehmed. This is Gentile Bellini's only known medal and was presumably made on his return from a visit to Constantinople in 1480. Medal depicts on the obverse the bust to the left of Mehmed II, wearing a turban. Inscription. On the reverse three crowns. Inscription. Numerous contemporary casts of medalsof Mehmed survive, as Western interest in the Ottoman dynasty was high. Mehmed II's aggresive expansionism and the threat this posed to Europe meant frequent wars, and contemporary written accounts of the court and customs of the Ottoman Empire fired the imagination of Christian Europe. 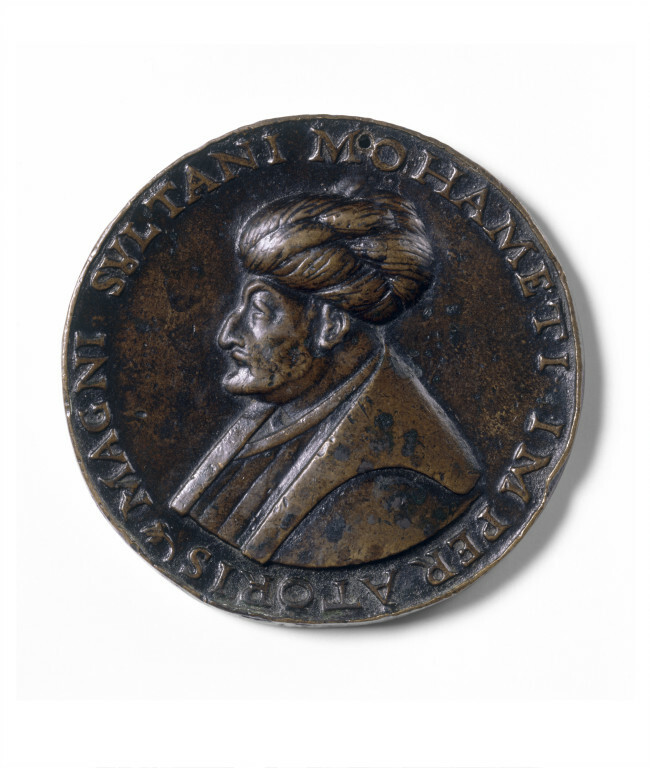 These medallic representations designed or derived from portraits by the Italian artists patronized by the Sultan were a key medium by which Europe became familiar with the Sultans image. 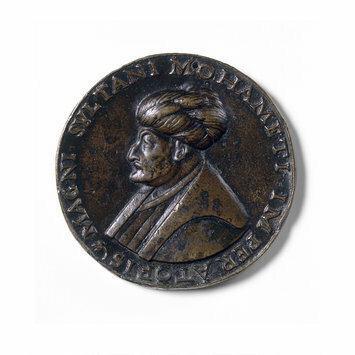 It is likely that this medal was designed after the artists return to Italy in response to demand for the Sultan's image following his death in 1481. Historical significance: This is Gentile Bellini's only known medal and was presumably made on his return from a visit to Constantinople in 1480. Cast in bronze or lead, the Renaissance portrait medal commemorated individuals or events. They were used as gifts and mementoes and were inspired by Roman coins, with their portraits of rulers and allegorical representations on the reverse, excavated all over Italy and eagerly collected by humanists. The large commemorative gold medals of Emperors Constantine and Heraclius, acquired in 1402 by Jean de France, Duc du Berry, were a precedent for the large scale of the earliest Renaissance portrait medals. These had a strong appeal for patrons under the influence of classical learning and values, and provided a durable, portable and sophisticated portrait that could disseminate their reputation.